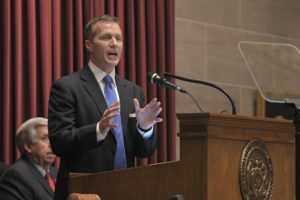 ST. LOUIS- A St. Louis Circuit Judge issued a ruling Thursday morning against cameras in the courtroom for Missouri Governor Eric Greitens’ upcoming invasion of privacy trial. Judge Rex Burlison ruled against media requests to allow cameras in the courtroom when Greitens goes on trial this month. Judge Burlison says he based his ruling on security concerns and the fact that the woman with whom Greitens had an affair opposes video cameras in the courtroom. However, the judge says he would consider allowing audio recording and still photos. A St. Louis City grand jury indicted Greitens for felony invasion of privacy in February, for an alleged March 2015 incident. Greitens has admitted to an affair, but has denied wrongdoing. Jury selection is scheduled to begin next week in Greitens’ trial in downtown St. Louis, and opening statements are scheduled to start on May 14.